We’re beginning a new kind of adventure as we start to make our way back home to Alaska after visiting family and friends back east. Jim has always wanted to get a 5th wheel RV, and friends in Virginia happened to be selling theirs… so Jim has gotten his wish and we’re now heading across country with the new rig. With a shorter boating season where we live, it makes sense to spend some of the “off season” exploring some of the many amazing places in the western states. But first we have to get west, and we’re learning a lot on this “forced march” pace to get to the other side of the country. 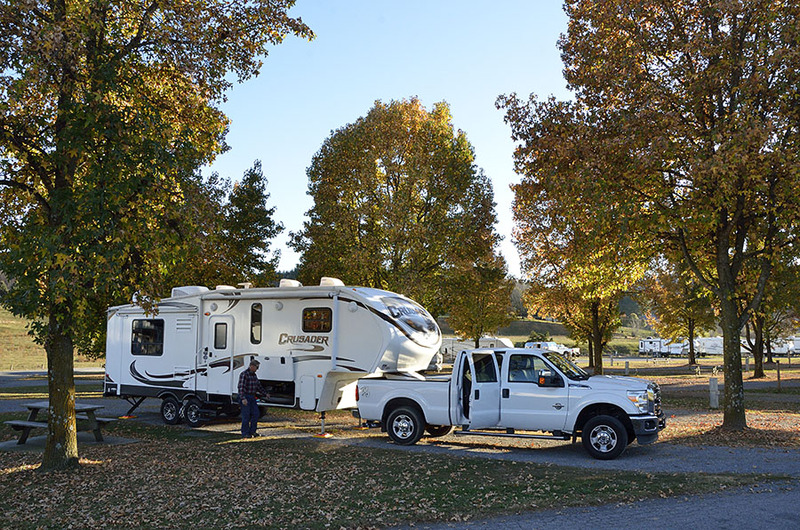 It makes sense to take a more southerly route to avoid bad weather at this time of the year, and we enjoyed the rolling green hills and lingering fall color through southwestern Virginia. 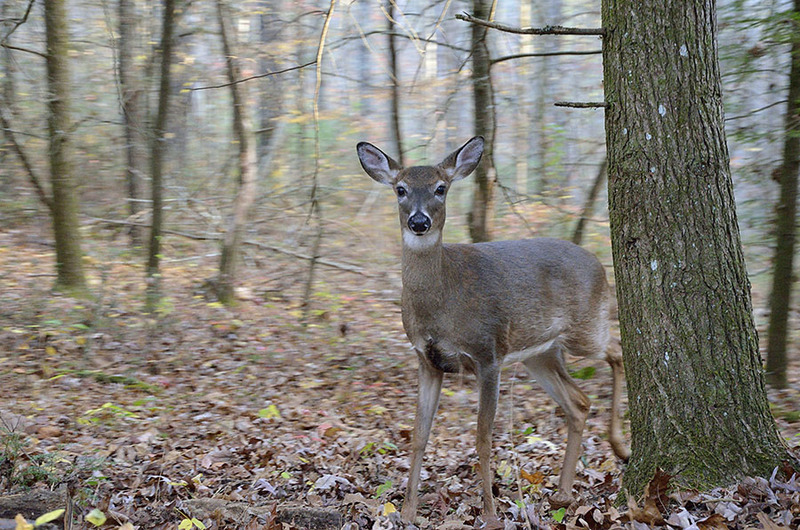 We spotted deer, wild turkeys and bald eagles as we made our way into Tennessee, taking a couple of days to explore Great Smoky Mountains National Park, which straddles the Tennessee-North Carolina border. 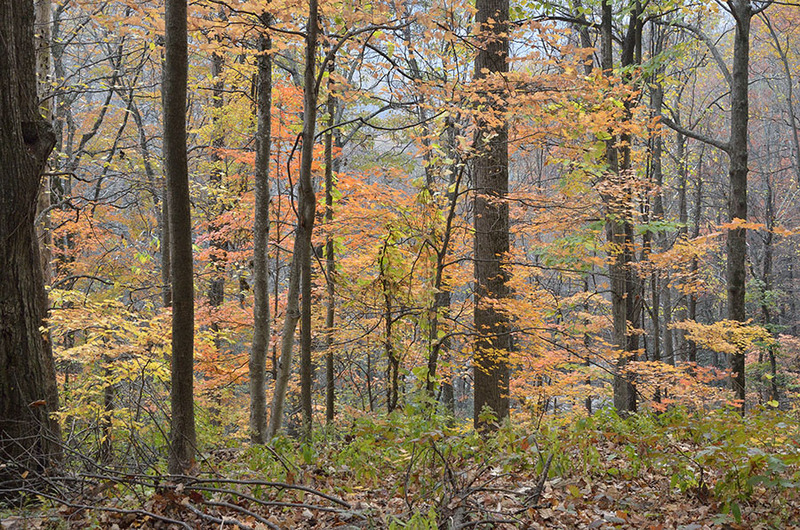 The peak fall color had passed, but there was still plenty of pretty leaves at lower elevations. 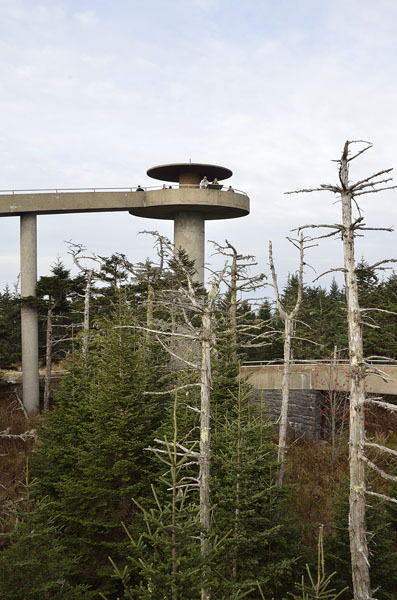 On the recommendation of friends, we headed for Clingman’s Dome – the highest peak in the Park (6643′) and the third highest peak east of the Mississippi. If you’re willing to make the steep 1/2 mile hike to the top you’re rewarded with great views from the observation tower. We crossed the Appalachian Trail near the summit which was fun since we’ve hiked sections of the Trail years ago when we lived in Virginia. Unfortunately the view on this day was marred by smog and smoke from the wildfires in the region; on a clear day you would be able to see 100 miles. 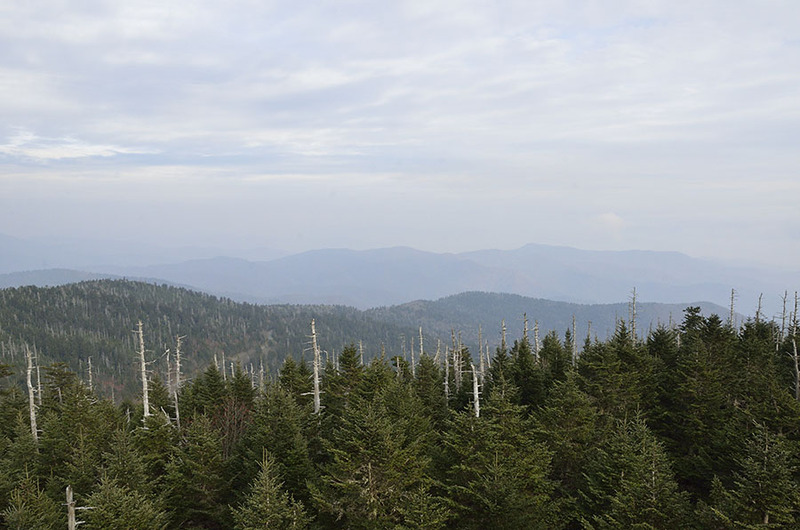 The Great Smoky Mountains got its name from a natural haze produced by the vegetation in the area, but now pollution is the major cause of the haze. 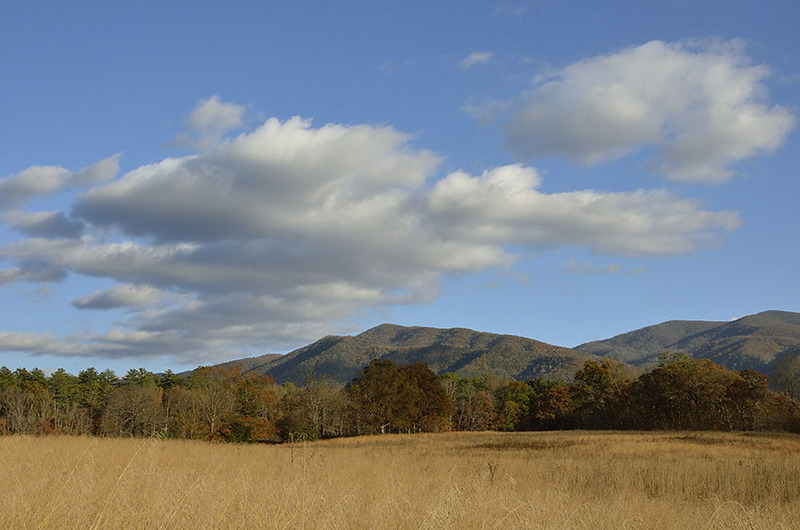 After sitting in the truck for so long it felt good to get out and hike, so we explored a different section of the park the following day – Cade’s Cove. 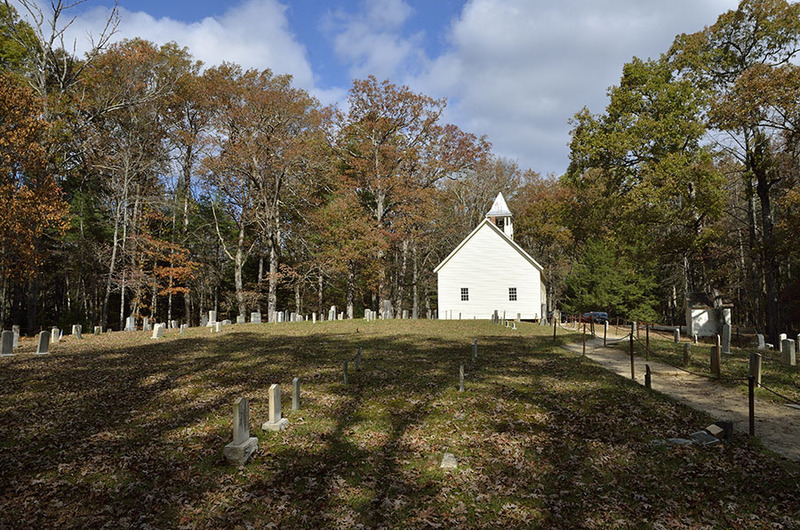 This Cherokee hunting area was eventually settled by Europeans in the early 1800s, with churches and homesteads cropping up alongside the valley’s pasture land. 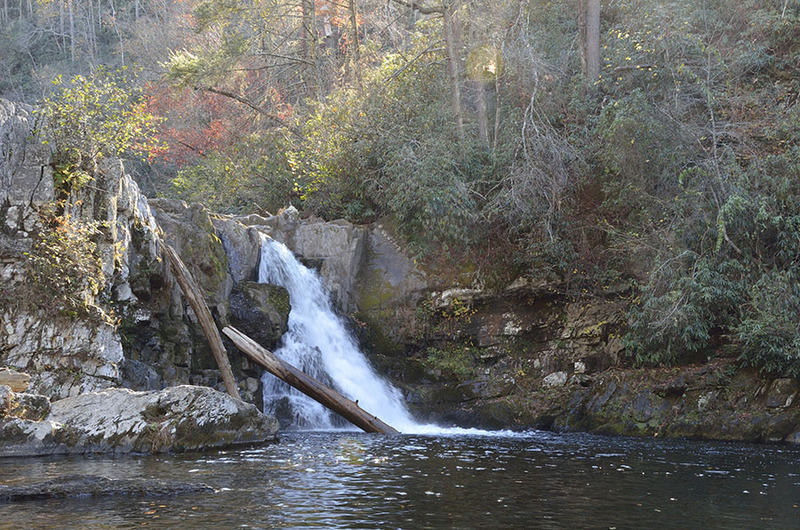 One of the rangers suggested a hike to Abrams Falls so we ventured out for some good exercise and fresh air. I miss so much of the beautiful fall color now that we live in an evergreen rainforest, so it was a treat to see the colorful leaves and to hear the crunch of them under our feet. 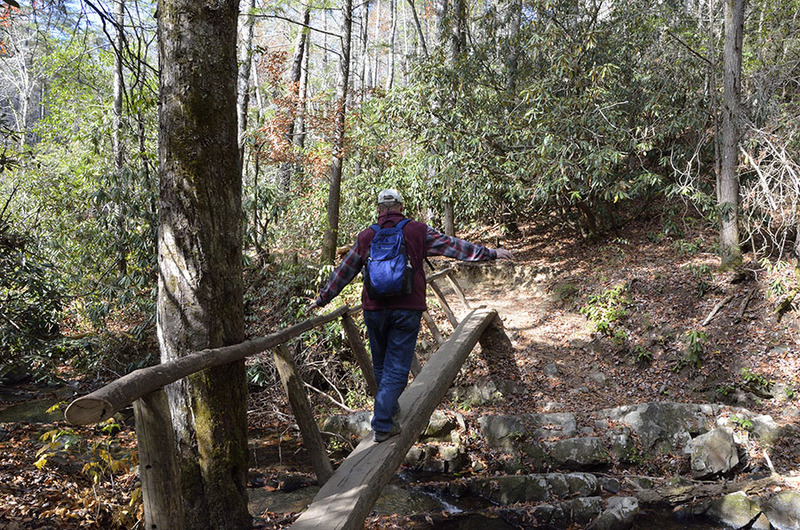 We thoroughly enjoyed the hike, even with all the sharp rocks and the rickety log bridges, though we didn’t linger too long at the waterfall since the days are getting shorter and we wanted to be sure to return with plenty of daylight. As you may know I love bears and Great Smoky Mountains are well known for black bears, though the average size of the bears here is about half the size of the black bears back in Alaska… and they’re tiny compared to our brown bears. We didn’t see any bears but we did see wild turkeys and deer. Spotting wildlife of any kind always makes us happy. 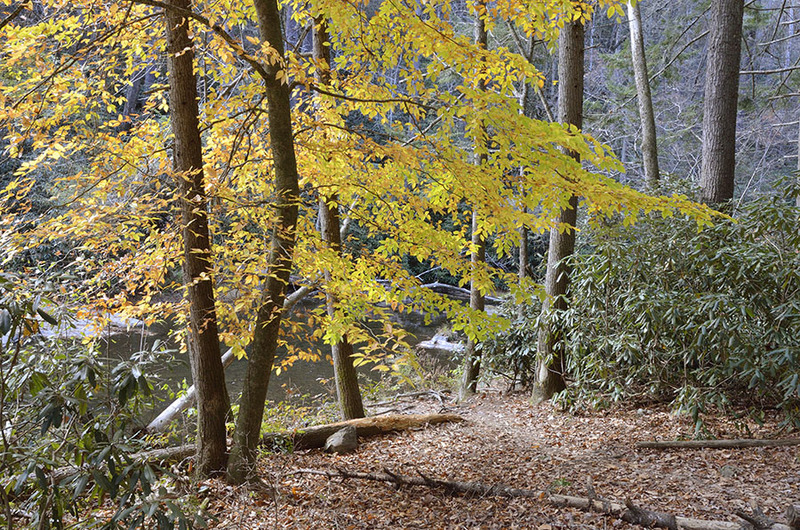 We entered the park through Gatlinburg, Tennessee, and that was a whole different kind of wild life. It was such a shocking contrast to drive through the middle of the most stereotypical Tourist Trap that is the main street in Gatlinburg in order to get to the National Park. We prefer our wildlife from Mother Nature… not garish and plastic. To each his/her own. 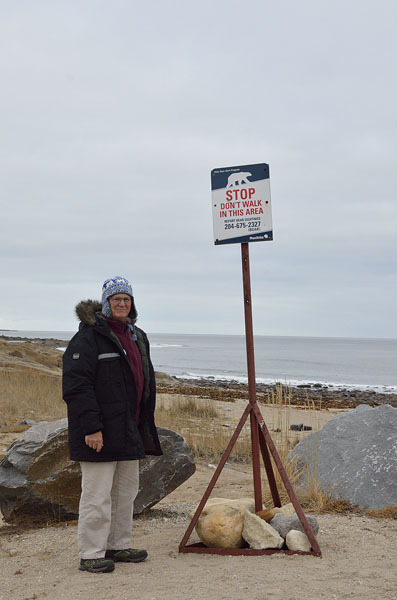 We arrived in Churchill, Manitoba for a few days during the 6 week “season” when polar bears congregate on the shore of Hudson Bay waiting for the sea ice to form. Polar bears are creatures of the sea ice – that’s where they find their primary food source (ring seals), and it’s where they are most comfortable – they’re designed to thrive in the extreme cold. It’s interesting to note that Churchill, Manitoba is only 200 miles north of the same latitude as our home in Petersburg, Alaska. The Japanese Current keeps our part of Alaska temperate, while the currents feeding Hudson Bay bring colder water and weather that will freeze salt water. 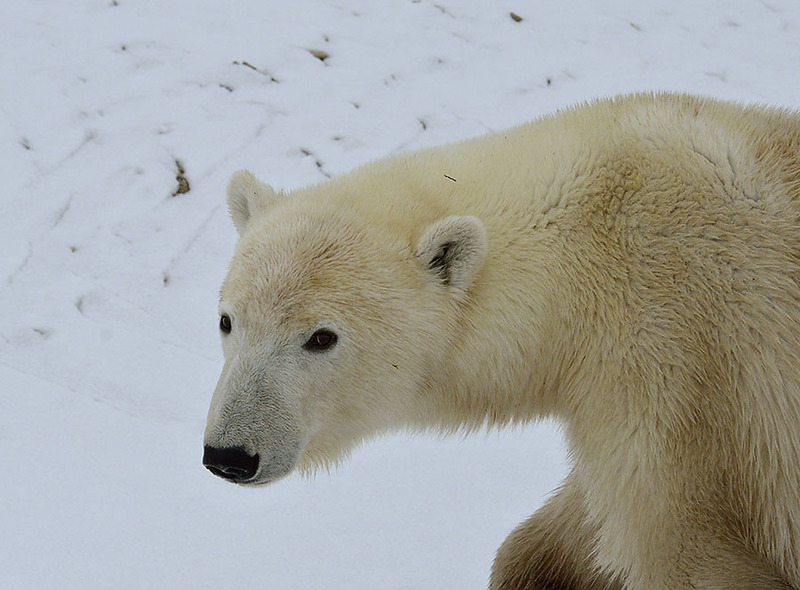 Did you know that a polar bear’s skin is actually black? And their fur is clear, specially designed to help keep them warm in extremely cold temperatures. 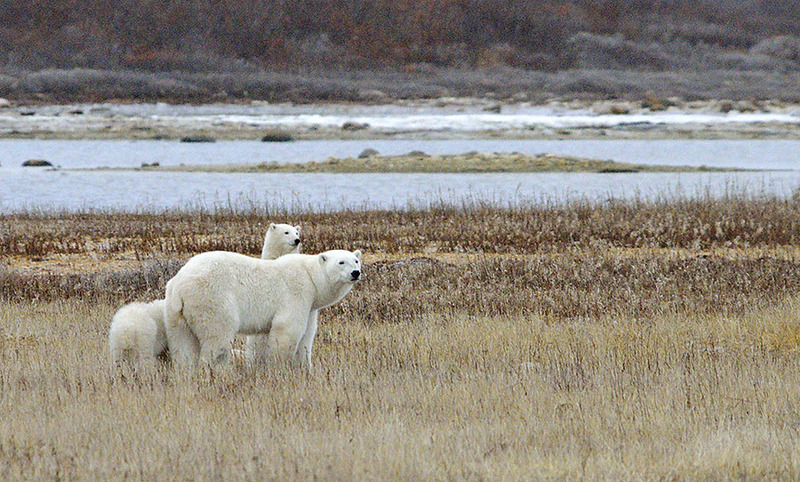 The week we were in Churchill the temps were pretty warm – right around freezing, so the bears weren’t as active. They don’t have good food sources on land so they haven’t eaten much all summer. At this time of the year they’re hungry and thinner, and they need to conserve as much energy as possible. Polar bears are apex predators, and although humans aren’t their preferred food source, they absolutely will hunt and attack humans when they’re hungry. 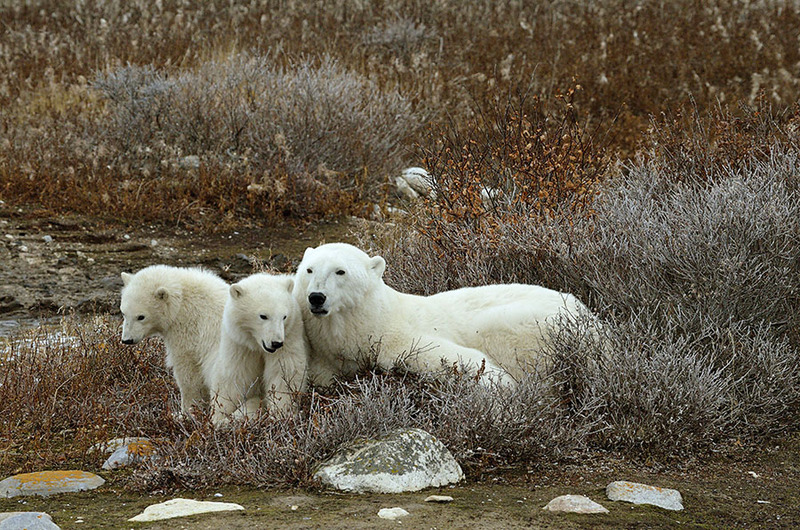 Unlike black and brown bears, these white bears are not to be trifled with! Bear spray would just make a polar bear think “ooooh – spicy food!” We were able to get so close to these predators by getting out on the tundra in polar rovers like these – with tires tall enough that a standing bear can’t reach the windows or the open viewing platform. 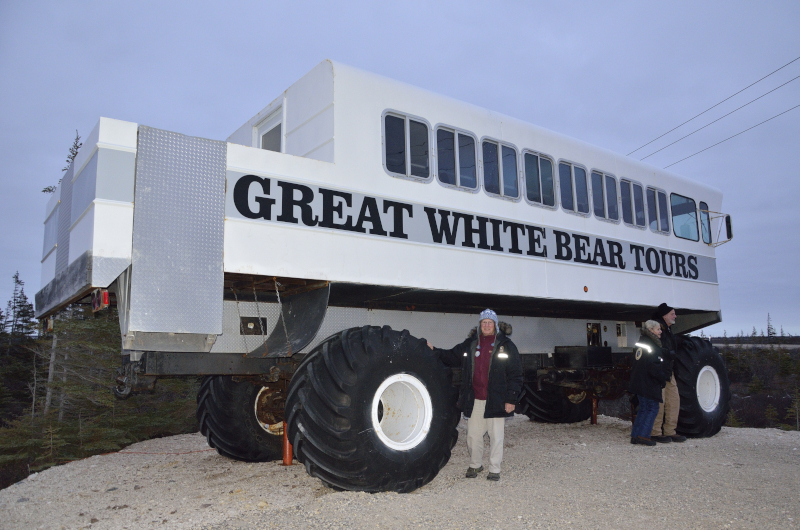 And to maximize our time on the tundra, we stayed in a tundra lodge – a small “train” that is parked out on the Hudson Bay shoreline in the midst of bear territory. It had sleeping cars, a lounge, and a dining car, and no one sets foot on the ground. There are steel mesh open platforms between each car, and occasionally a bear would hang out underneath. The bears are curious about the rovers and the lodge probably because they see them as big cans of meat. If they could get one open, they’d have a pretty good meal. 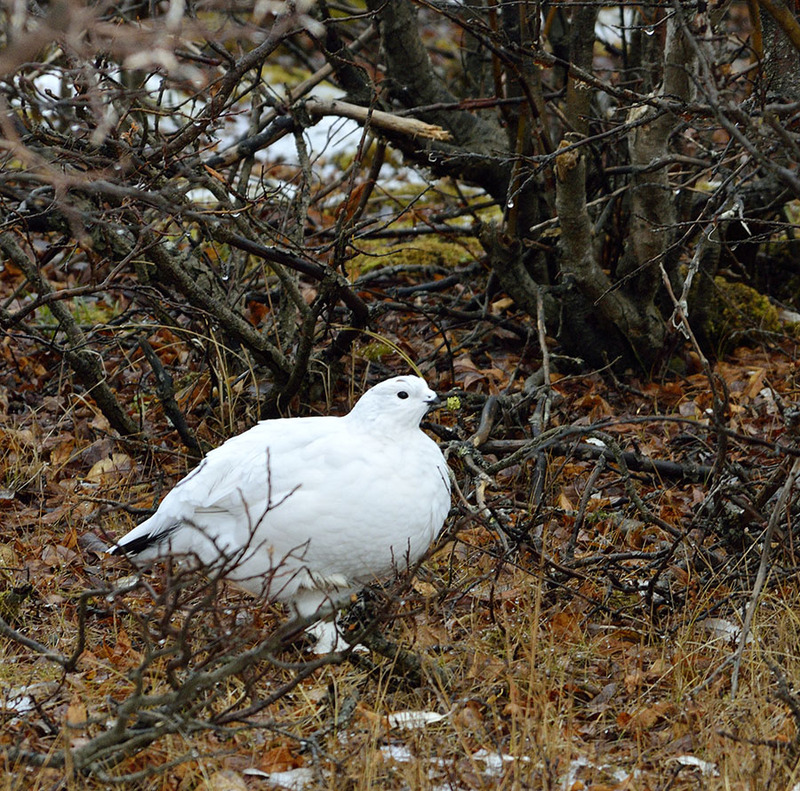 In addition to the bears, we spotted two snowy owls… …arctic fox, a black morph of a red fox, snow buntings, and lots of ptarmigan. We saw some solitary bears, but my favorites were the mothers and cubs. In one instance we spotted a mother with two cubs that ran from another mother and single cub, though we couldn’t see any overt signs of aggression between them. The little family that napped and snuggled together was my absolute favorite, and we were fortunate to watch them for a nice long time. As a knitter traveling with friends to a chilly place, I had to make some appropriate hats to keep us warm while watching the bears, so I found a pattern for polar bear hats… …and they worked pretty well. Our adventure on the tundra was much too short, but we had a great time and we met a number of exceptionally nice people. 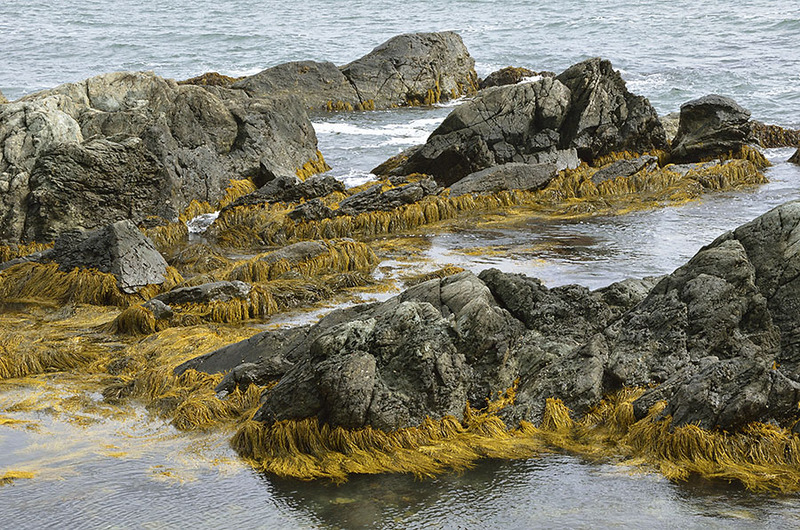 Living in Alaska makes us more aware of the impacts of climate change – coastal communities in our state that depend on sea ice formation to protect them from winter storms are now pounded by waves and residents will have to relocate. Warmer temperatures are causing plants and animals to move farther north, competing with native species and dramatically changing the balance. 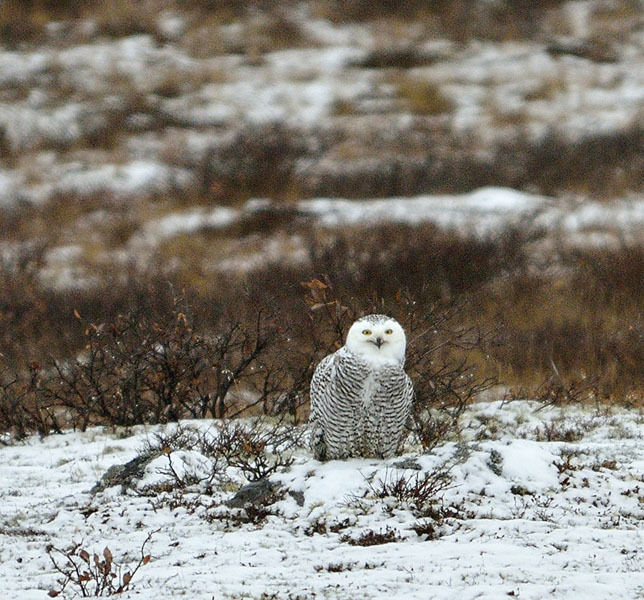 Arctic species are threatened more and more literally every day, and as a nation we must take a leadership role in addressing the man-made impacts. We have a responsibility to protect our planet so our children and grandchildren can see polar bears and other arctic animals in their lifetimes. 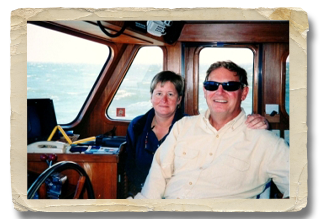 Spending time catching up with our boating friends Mary and Bill was a real treat, and we especially enjoyed seeing some familiar New England places through the eyes of locals. 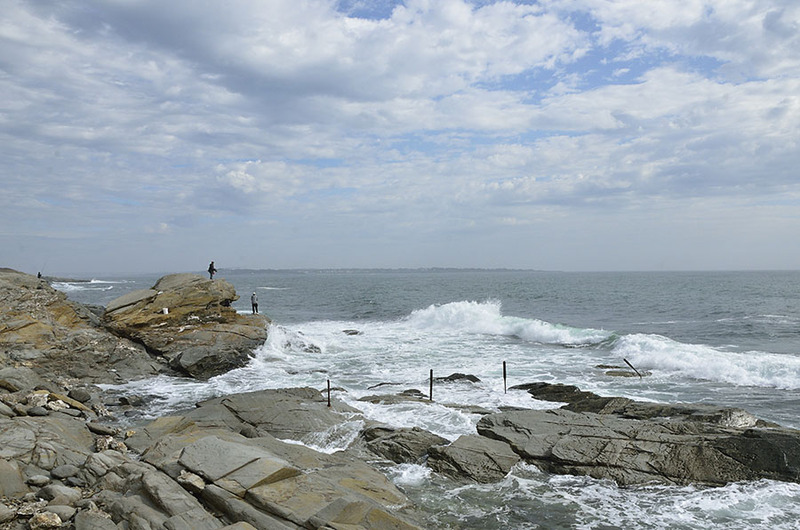 After our perfect day at Mystic we headed to the corner of Narragansett Bay and Rhode Island Sound for a picnic lunch. Fortunately the winds were light so the breakers weren’t too frisky, but it was fun to imagine what it would look like there on a stormy day! We’re “water people” at heart, and it felt good to sit by the sea and look out on waters where we’ve traveled with ADVENTURES. 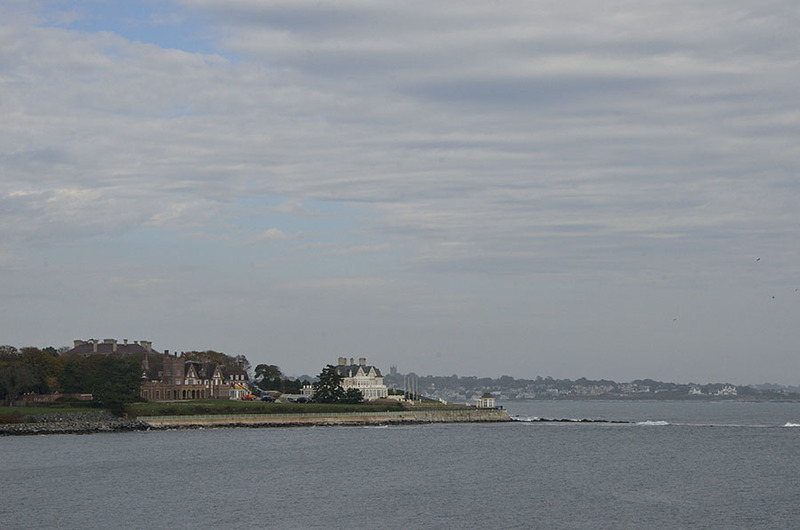 After our picnic we headed over to Newport, RI – a very pretty town, though on our previous stops we always found it to be too expensive and crawling with arrogant young racing sailors. 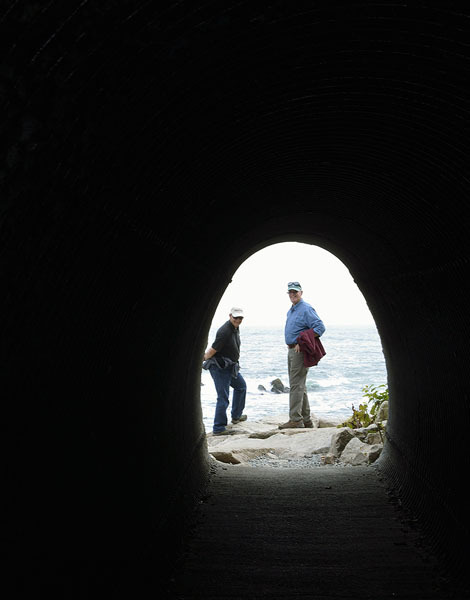 We were thrilled to have our friends show us a different side of things – the Cliff Walk. 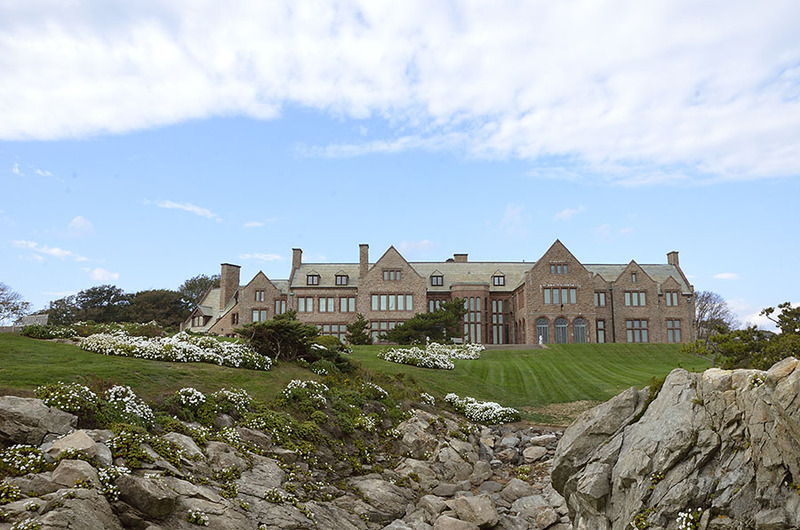 Newport is famous for its mansions as well as for sailing, and the Cliff Walk is a public easement along the rocky shoreline in front of many of the amazing mansions. Once again we had a perfect day to enjoy the views since a more typical autumn day could bring cold wind off the ocean and crashing breakers that would get the trail wet. The mansions were amazing – such varied styles and sheer numbers of them! Many were under renovation now that the summer season is over and the wealthy families have retreated to warmer climes. It’s a great trail – sometimes level, sometimes paved, sometimes comprised of huge boulders, even a tunnel, but always a great view. The tide was going out so we could see all the rocks just off the shore – treacherous to navigate in the days before we had good charts! It was another perfect day, ending with a walk on the beach in Narragansett – amazed at all the locals who were swimming in that chilly water! 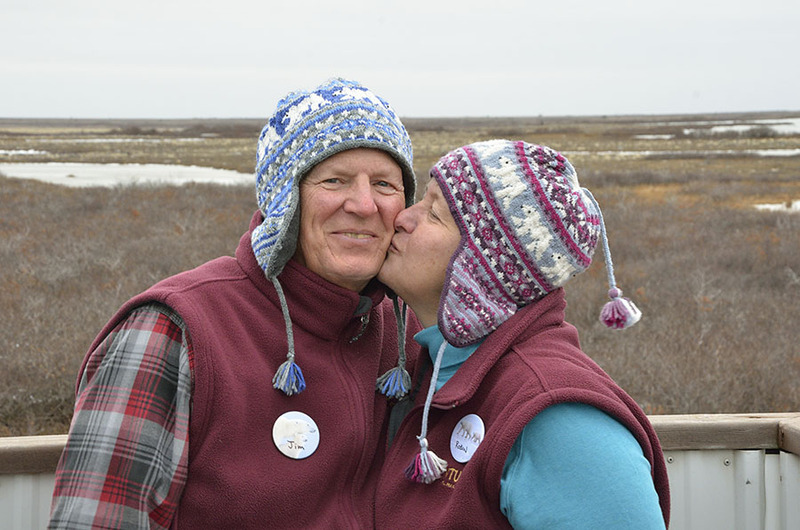 But we were in Rhode Island to see Mary and Bill for another reason – to go to the shores of the Hudson Bay in Canada to see polar bears! 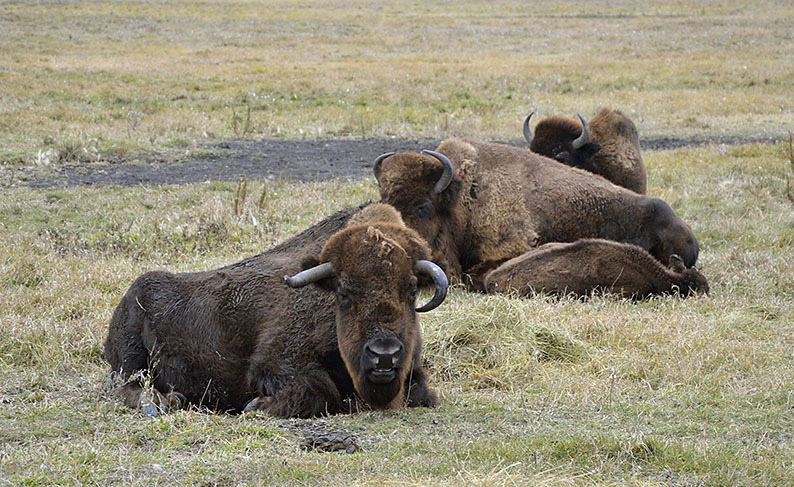 The title of this post mentioned bison, not polar bears… so let me explain. 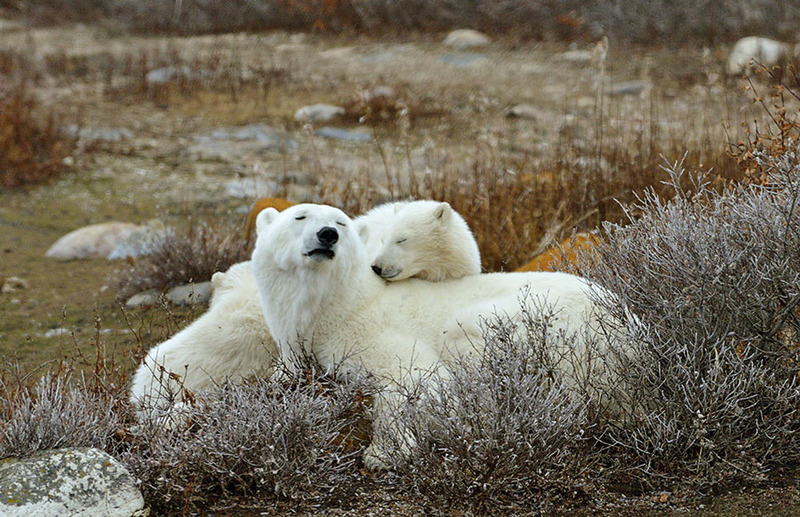 One of the southernmost places to see polar bears is Churchill, Manitoba on Hudson Bay. Churchill sits at a little notch in the land where the sea ice forms earlier than on any other part of the Bay. 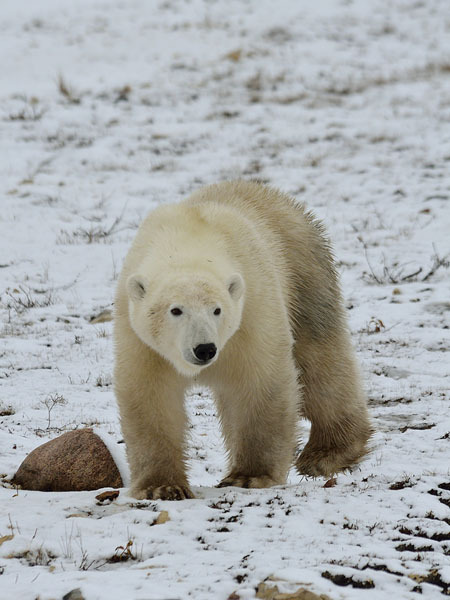 Polar bears live on the ice – that’s where they hunt for their primary prey (seals), and they congregate near Churchill at this time of the year waiting for the ice to form. 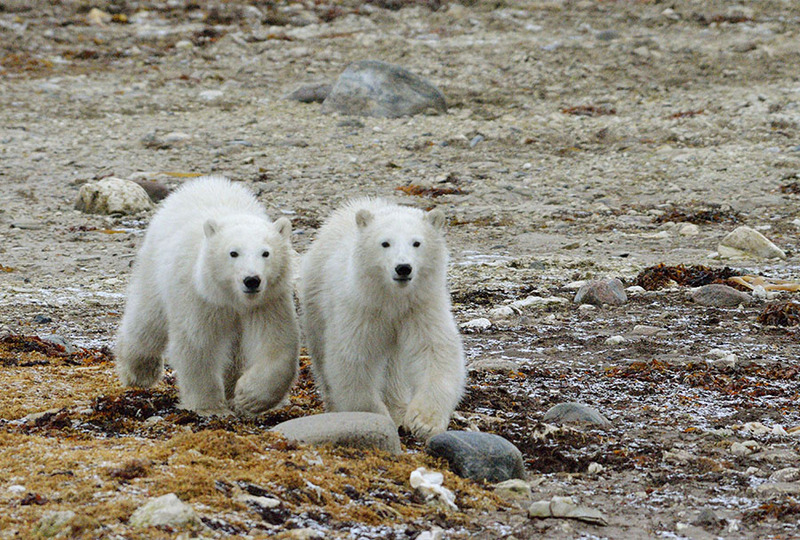 We’ve always wanted to see polar bears and happily discovered that Mary and Bill did too. To make it more interesting, Mary lived in Churchill for 2 years as a young girl since her Dad was doing research for the Army there. 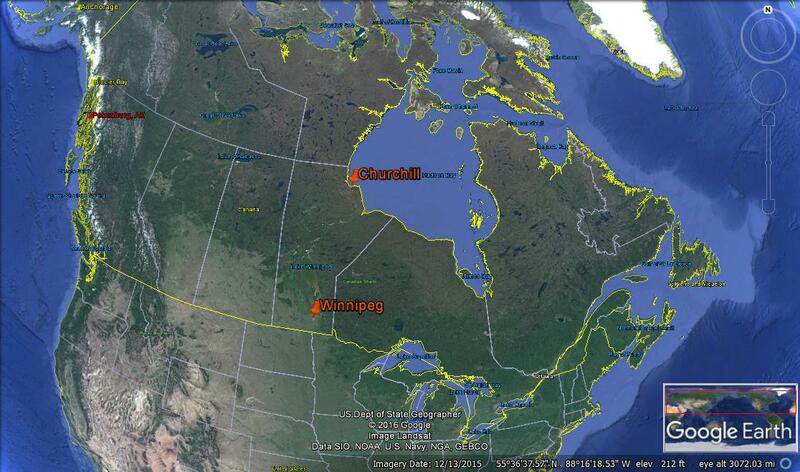 In order to get to Churchill, we have to fly to Winnipeg (the orange label in the middle of the map). Winnipeg sits on the prairie and is a crossroads for trading, with the Red and Assiniboine Rivers converging there, as well as railroads. We spent an extra day to tour the city and learn a little more about the area… and one extra day was not enough! 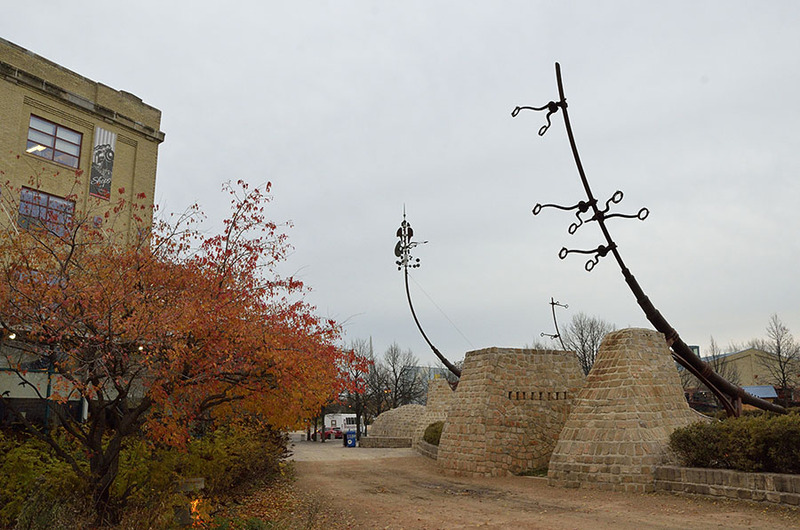 The Forks (where the two rivers converge) was interesting – a place where aboriginal people have been meeting and trading for over 6000 years, later joined by Scottish settlers, European fur traders, railroad workers, buffalo hunters, and many other immigrants. The National Human Rights Museum is located in Winnipeg – a dramatic building that we didn’t have time to visit. 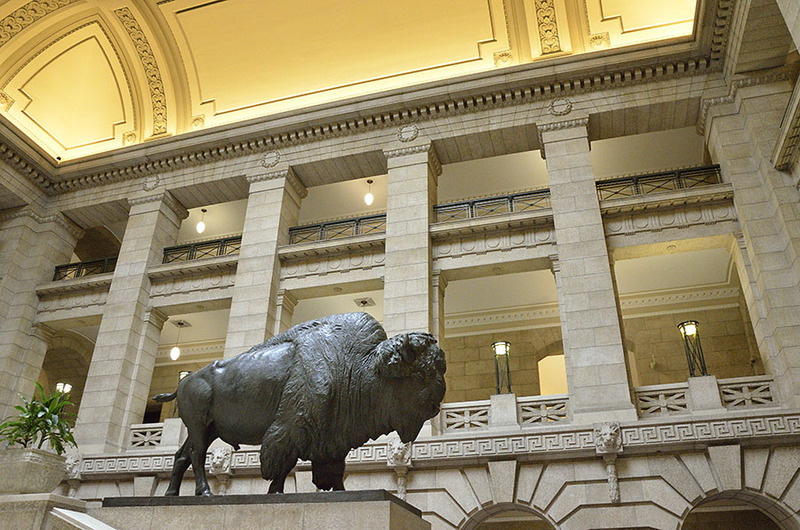 The Manitoba Museum is terrific – we could have spent several days going through it all. 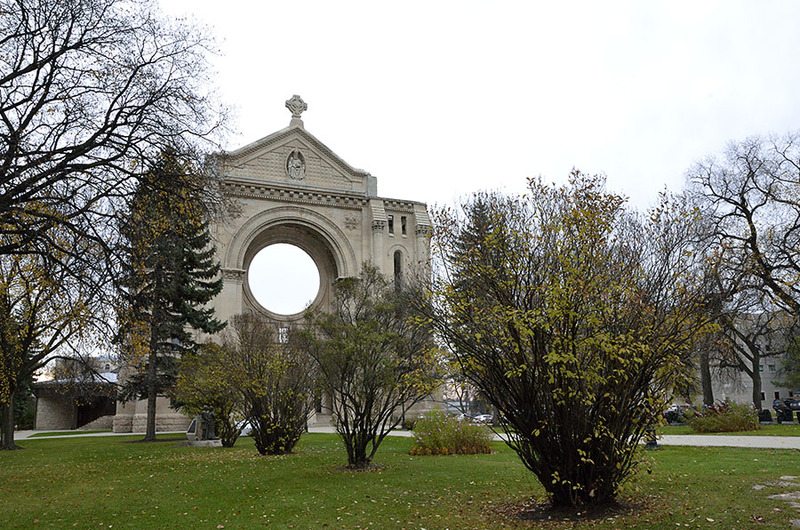 We learned about the French side of town, and saw the edifice that remains from the St. Boniface Cathedral which burned down in 1968. 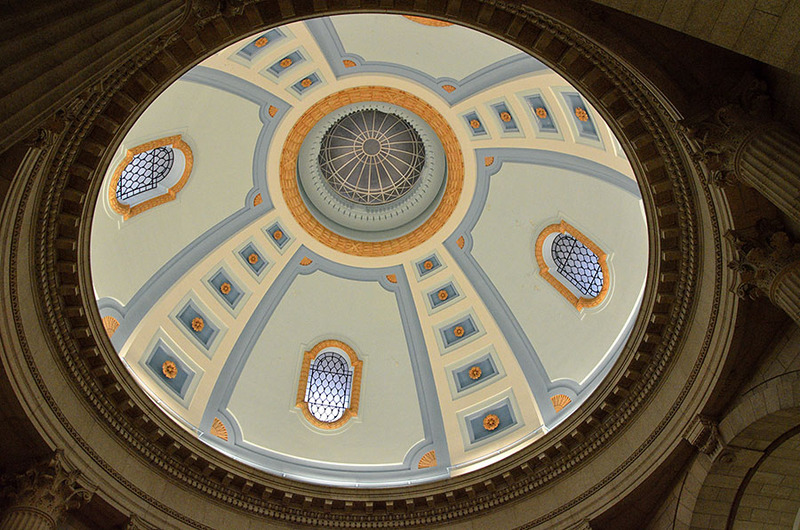 We stopped to see the Provincial Legislature building – very pretty, with huge bison sculptures in the lobby and a beautiful dome. 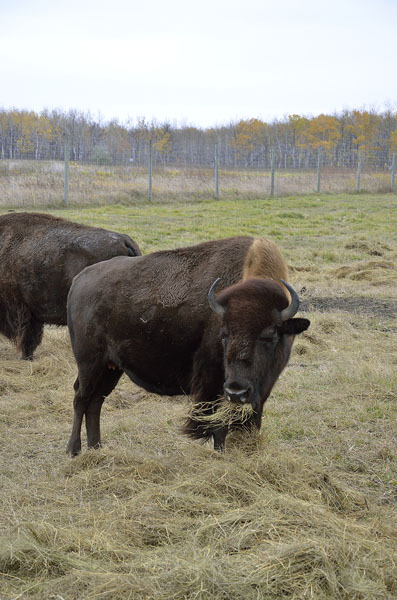 And because bison were so important to the history of the region, we had to see some real ones. This herd is habituated to a small bus that visits their field. They really are massive creatures! And I particularly liked this one – dare to be different!